After a long day at work or running some errands here and there, walking from one point to another and commuting, our feet gets really tired don't it? A comfortable footwear is a must for these walkathon activities to minimize the burden we give our feet. In Makati, public utility vehicles cannot just unload their passengers anywhere. The stop I get off is two blocks away from the office. Walking becomes part of the daily routine. I get a little exercise in the morning which is a good thing but my feet suffers when I am not wearing comfortable shoes. In my perpetual search for feet-friendly walking shoes, I stumbled upon Solemate Footwear at SM North Edsa Department Store. These heel-savers were on sale when I bought them last Tuesday. 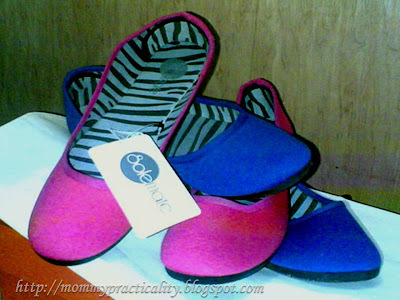 I got 2 pairs for only P399.00! Regular price is P299.00 each. The Solemate pairs I bought are made of cloth material. They have soft cushioning inside which makes walking a lot relaxed. The rubber sole is made of non-slip material, so these flats are safe to use on rainy days! Solemate is available at SM Department Stores nationwide. If you're an on-line buyer, it's also available on Sulit.com . Now my feet need not worry about stressful walking, blisters and callouses because they have found their Solemate. I love the zebra print inside! Is that the shoe you can roll? Good day! In this blog article did you use the data from any extra studies or these are totally your own ideas? Thank you so much in advance for your reply.